The North Carolina House passed a bill Wednesday with the misleadingly simple title of “Property Protection Act.” The bill has also come to be referred to as the “ag gag” bill because it is widely understood to be targeted at silencing those who would record and publicize disturbing images or sounds from facilities used to raise and/or slaughter and process animals. 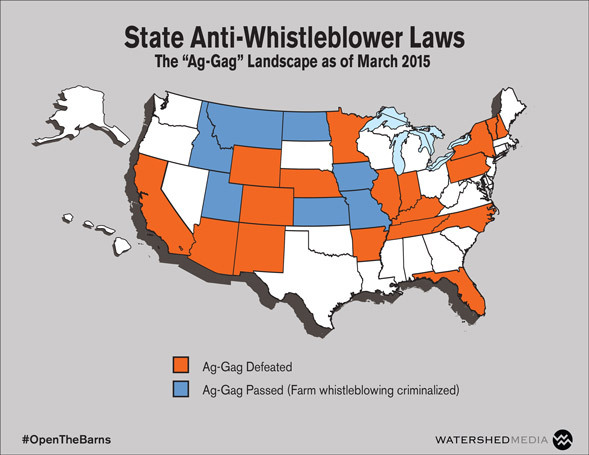 Defenders of the bill, which included widely respected progressives like Rep. Rick Glazier, argued forcefully that the language of the bill is drawn in a very narrow fashion so as to protect whistle blowers and others who would expose wrongdoing or illegal activity. And indeed, the proposal includes references (both direct and indirect) to numerous anti-retaliation statutes and includes none of the criminal penalties that were present in previous “ag gag” proposals. It’s also easy to envision compelling scenarios in which employers would be rightfully aggrieved at the idea of employees secretly recording and posting to the Internet the contents of, say, staff meetings or private strategy sessions. That said, the bill as written still raises serious and nagging questions about freedom of speech and the public’s right to know important information. For instance, it appears that under the terms of the bill, an employee who becomes aware of inhumane or unsanitary (but not necessarily illegal) food preparation practices could be sued, silenced and ordered to pay damages if she recorded a video of such practices on her phone and publicized the recording. Similarly, an office worker who, for instance, records and publicizes the fact that his boss keeps a noose in his office along with some racist posters and literature would appear to be potentially liable for damages. Under the bill, liability would appear to hinge on the employee’s intent in entering the “nonpublic areas of an employer’s premises.” The bill specifies that if an employee enters for “a reason other than a bona fide intent of seeking or holding employment or doing business with the employer” he or she could be barred from sharing sounds, images and other information obtained. Though not completely clear, this presumably means that if an employee works in the front office and enters the slaughterhouse solely for the purpose of gathering information that he or she has heard about, there could be trouble. If, on the other hand, the employee already works in the slaughterhouse and records activities there during the course of the regular day, he or she might conceivably be protected. The problem, of course, with all this, is that defending oneself against such a lawsuit would almost assuredly be horrendously expensive and intimidating. An employee might conceivably “win” such a case but still lose his or her shirt in paying lawyers and other costs of defending the case. Moreover, as a practical matter, it’s easy to imagine how the mere threat of such a suit (particularly by some corporate giant) would be an enormously intimidating. How many average employees would be willing to take the risk of testing the matter under threat of being ruined financially for life? The bottom line: Crafting a statute that protects legitimate property rights when they are competing against the First Amendment’s free speech guarantees and the flow of information in a free society is an enormously complex and difficult proposition. Perhaps there is some reasonable point at which the two competing interests are properly balanced, but then again, perhaps such a balancing point really doesn’t exist. Let’s hope, at a minimum, that sponsors of the bill continue to fine tune the language with an eye toward finding that point and that, if they can’t do so, they opt for language that errs on the side of free speech. The current version isn’t there yet.